Edinburgh Central Apartments showing Edinburgh Castle on the horizon. 1, 2 or 4 bedrooms. Edinburgh Central Apartments are situated literally 5 minutes walk from the west end of Princes Street and therefore ideally situated to enable any visitor to make the most of Edinburgh's sights and places of interest. 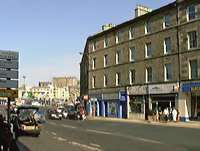 There is a wide variety of shops, international restaurants, cinemas and bars in the area. The Usher Hall, Kings Theatre and Lyceum Theatre are close by as is the Meadows Park which encompasses Bruntsfield Links and children's play area. The new International Conference Centre is only 3 minutes walk away. The apartments include all the facilities guests may need and all apartments are compact and easily maintained. 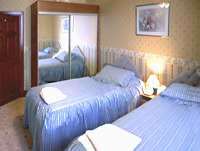 Apartment facilities include fitted kitchens with washing machine, shower rooms, full central heating, close carpeting throughout, colour TV, entry phone and pay Telephone. All kitchens have gas hob, electric oven with extractor fan, microwave cooker, refridgerator, electric kettle, toaster, iron and ironing board and are fully equipped for more than the maximum number of guests. Please say you found Edinburgh Central Apartments through About Scotland!